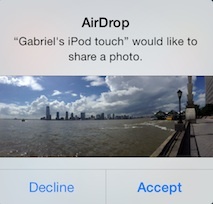 One of these features is called AirDrop. AirDrop lets you share pictures, videos, locations on maps, contacts and links to websites using Wi-Fi and Bluetooth between iOS devices. You need an iCloud account to be able to share and both iOS 7 devices have to be signed into an iCloud account.Transfers are encrypted for security purposes. At the moment the following iOS devices are supported: iPad 4th generation, iPad Air, iPad mini, iPad mini with Retina Display, iPhone 5 and iPhone 5s and iPod touch 5th generation. In this example I will be showing you how to transfer a picture between my iPod touch and my iPad Air. 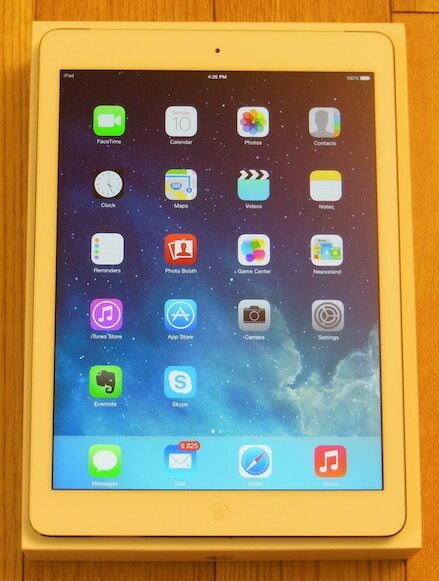 In this case both devices are on iOS 7, are logged into iCloud and are connected to the same Wi-Fi network. The first step is to turn on AirDrop on both the iPod and the iPad. We can do this by opening up Control Center and tapping on AirDrop. 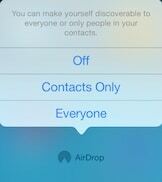 When you tap on AirDrop, you will be offered 3 options to make your device discoverable: Off, Contacts Only and Everyone. In this case to make things simple, I will select “Everyone” on both the iPod and iPad. Notice the Wi-Fi and Bluetooth symbols light up when you turn on AirDrop. Now that AirDrop is on, I will open the Camera App on my iPod and select a picture I want to share. Tapping on the share icon will open the sharing menu. 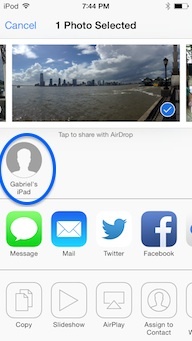 Next, I will tap on the AirDrop icon to transfer the picture to my iPad. A popup dialog box appears on the iPad showing a preview of the picture and asking whether you want to receive it. At this point, I accept the incoming picture on the iPad and voila! the Camera App opens with the picture that was transferred from the iPod! In a similar way, we can transfer other things like a contact, a video, a website, etc. 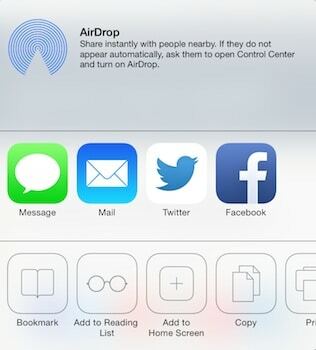 Have you tried AirDrop before? As usual, I would like to hear from you. Please leave your comment below.